Help/Questions (Answered) > who? what?? when??? This is probably a transposition bracket. It was apparently found on the bottom of lake champlain. The metal was badly pitted but was cleaned and painted. 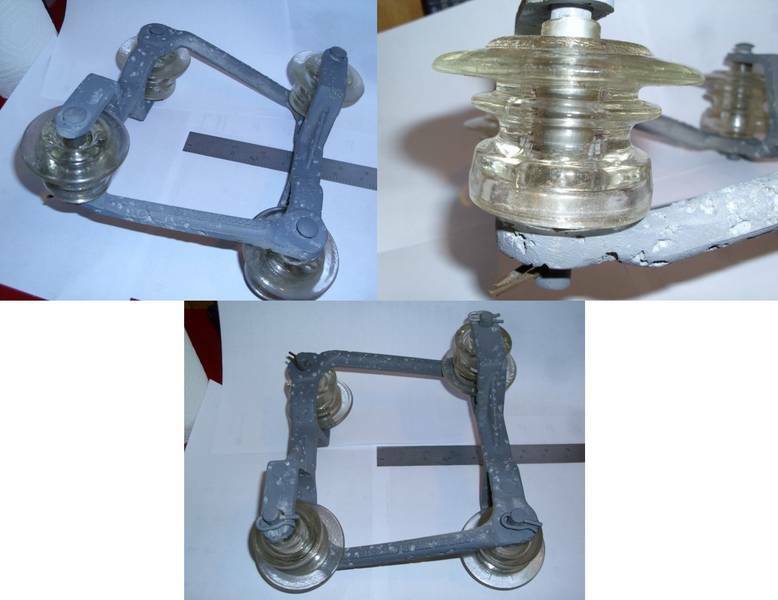 The 4 spool insulators have no markings I can see but seem to be in good shape. On one side it says something like 'CASE 5PIN BRACKET' the '5PIN' may be 'SPAN' or something else, its kind of mangled. There is what appears to be a pat number or two on one leg, but all I can read is that it ends in '655553'. It seems odd that there doesn't seem to be any way to attach it to something, was it meant to be suspended, or are there parts missing?? nope, nothing missing, this is a suspended transposition bracket with 4 spools.